Debbie Mehaffey has a sweet heart, a great sense of humor, and a deep commitment to the clinic and the women that it serves. She is compassionate and gifted at identifying clients’ long-term needs, not just an immediate crisis with which they are struggling. Debbie is a mighty prayer warrior and cherishes each opportunity to share the Gospel with our clients. She is a very diligent worker and demonstrates great love for those around her. She regularly blesses our staff by willingly accepting additional shifts when needed. 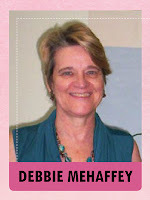 Debbie, it is our pleasure to work with you and witness the love you share for our Lord! If you are interested in serving as a volunteer, connect with our volunteer coordinator today!